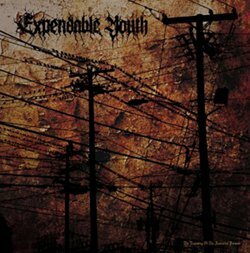 Expendable Youth – The Exposing Of The Immortal Person LP - Old Punks Never Die! I love it when I take a bit of a punt and end up with another slice of perfectly turned out coloured vinyl (black-splattered beer) and accompanying noise (blood-splattered ears). Such is the case with EY’s ‘The Exposing Of The Immortal Person’ LP, put out (at least in part) by the eternally-friendly Alex of Distro-y Records. I’m still a bit of an amateur when it comes to this ‘neo / melodic crust’ thing but, as Alex has made wholesome comparisons with a couple of the prime movers and shakers of the style, I thought ‘why not?’. I’ve got to say it’s one of the best instinctive moves I’ve made in a fair while. Chugging riffage à la Metallica in their heyday but embellished with well-crafted crust twiddles, sharp breakdowns that kill the pace but not the power, a skinbasher who appears to have eight arms and legs in faultless syncronicity, bass licks that aren’t afraid to hold centre-stage without forgetting their main job of fleshing out the bones, and all topped by the voices of the righteously angry – you get the impression that they would turn themselves inside out if they screamed any harder against the injustice and oppression that pervades our lives. The spot-on production job gives space to every member while drawing out the collective dynamics perfectly. If this is what the kids are listening to and creating these days, count me in. Overall, it’s a melodic, heavy, tight and shining example of punk evolution in practice. Right now this is on sale at Distro-y for the absolute bargain price of €5 plus shipping, but hurry up – only 500 have been pressed across the world and stocks are limited. Oooh this looks interesting, I’m gonna grab that sample track and give it a listen. Not sure when this was written, but thanks for the review!